The people became tired of sneezing through tall weeds, tumbling into deep holes and tripping over rocks as large as watermelons, of seeing nothing and going nowhere, so they made their way to the center of the town to decide what to do. Others thought it was a ridiculous notion. Yet the people could not see any other way to fix their town, so they decided to look for God. Without roads, the people could not go anywhere, least of all go searching for God. They looked toward the edge of town where two old houses stood, each with a single window. They called the man and woman who lived in those houses the Ones Who Could See Out Windows. So the people of the town sent the Ones Who Could See Out Windows to search for God. The Ones Who Could See Out Windows thought that God must be on the other side of the hill, somewhere they had not yet been. They wove their way through the tangled weeds, around the deep holes and beyond the large rocks to find God. When they disappeared beyond the hill, some people thought they could never return. The Woman Who Could See out Windows went to a tall mountain. The climb was steep, and when she finally reached the mountain’s peak, her body shivered from the cold, and she was breathless. She gazed up at the sky and tried to tug on one of the clouds. She looked down to the ground and watched the earth spin in a dizzy dance, but she did not see God. Then the Woman Who Could See Out Windows thought that God might be in the deep waters that covered so much of the earth. So she set sail on a ship that went far out into the ocean. One day the sea waters turned from placid blue to an angry foam. A storm stirred up the depths and the ship tossed and turned on the waves. The woman imagined what it would be like to tumble around in the belly of a big fish. But as the ship swayed back and forth, she felt as if she had a whole school of fish in her belly. The woman could no longer seek God in the ocean; she could only search on dry land. Meanwhile, the Man Who Could See Out Windows traveled to the desert. He listened for God in the desert winds, and looked for God in the sands. The sun burned his skin and the hot ground made blisters on his feet, but he did not find God. Then the man thought he might find God in the cool quiet of a cave. He searched in the dark for God, and he listened for God in the silence. At first, the cave’s wet walls soothed his sunburned skin. But then the black shade turned to thick ink, and he imagined scary sounds. The man became very lonely in the cave, and he did not see God. The Ones Who Could See Out Windows were tired and decided to stop looking for God. Each hoped the other had been successful on the journey. But when they met, the woman saw the man’s drooping shoulders, and the man saw the woman’s sad eyes. They knew that neither had found God. The woman put her cool hand on the man’s sunburned arm, and the man wrapped his blanket around the woman. It was a dark moonless night, and the Ones Who Could See Out Windows could see nothing but each other. In soft, small voices they talked long into the evening. They told each other their stories. One of the townspeople was sneezing through the tangled weeds when he saw the Ones Who Could See Out Windows approaching the town. He called to the others, and they all came sneezing through the tall weeds, tumbling into deep holes and tripping over large rocks to greet the man and woman. The Woman Who Could See Out Windows told her story. “I climbed a tall mountain. The Man Who Could See Out Windows told his story. “I walked across the desert sands that spread like a hot white fire over the land. I sat alone in a cave. The townspeople’s voices became louder and louder. They were so busy complaining about all the problems in their windowless, roadless town that they forgot about the Ones Who Could See Out Windows and about God. Days passed and everything was the same in the windowless, roadless town except for one thing. The Ones Who Could See Out Windows helped each other put windows in every room of their homes. Then the man and woman cut the weeds, filled the holes and cleared the rocks to build a road between their houses. “We have never been able to have any roads in this town, and we have never seen so many windows. “With God’s help,” answered the Ones Who Could See Out Windows. “We journeyed hundreds of miles looking for God, and then, we found each other,” said the woman. “And we discovered God was with us,” added the man. “What about what lies beyond the hill—the mountains, the sea, the desert and the cave?” asked a townswoman. “Wherever we are,” said the Man Who Could See Out Windows. “But I can’t see God anywhere,” insisted one of the men of the town. The Ones Who Could See Out Windows spoke in a whisper. The townspeople gathered close to listen. The setting sun blushed the sky a deep red and a breathless silence embraced the town. “God is in the between,” said the Ones Who Could See Out Windows. Whoever has seen us has seen God. We are in God and God is in us. 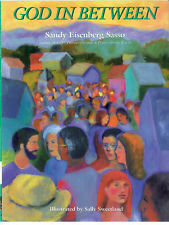 This entry was posted in Adult Education, Children's Resources, Evolutionary Christianity, Home, Progressive Theology, SERMONS, STORIES, Theology and tagged Acts 2:1-21 progressive sermon, emergent theology, evolutionary christianity, John 14:8-17 progressive sermon, progressive christian sermon, progressive Christian sermon Pentecost C, progressive christian spirituality, progressive christianity, Sandy Eisenberg Sasso, spirituality by Rev. Dawn Hutchings. Bookmark the permalink.